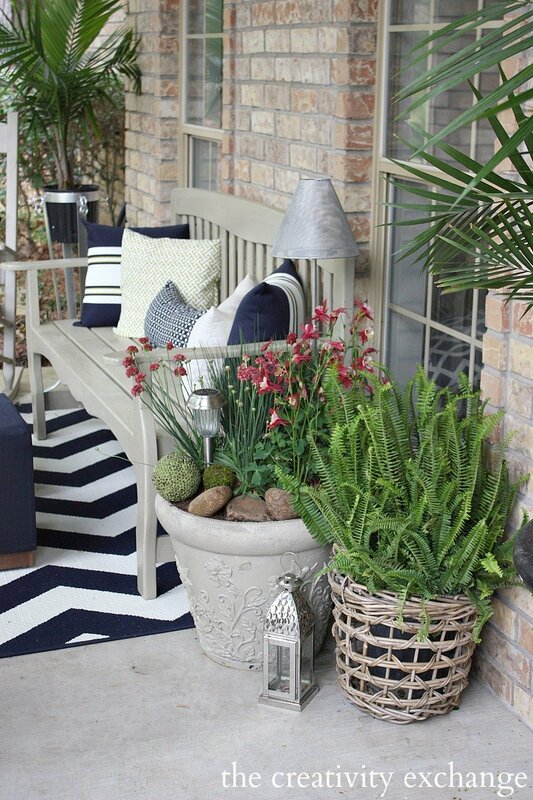 Well here it is, mid July and I’m just now doing my porch refresh for summer and fall. Usually, come April, the porch is the first thing I do. Unfortunately, starting about April, we had nonstop rain, floods and torrential downpours for about 2 months straight here in East Texas. It’s only in the last month that rain has stopped and we have been able to get outside and finally get to work. When the weather finally cleared up, we started by updating our back patio/pool area first, which was great to check that off our list. 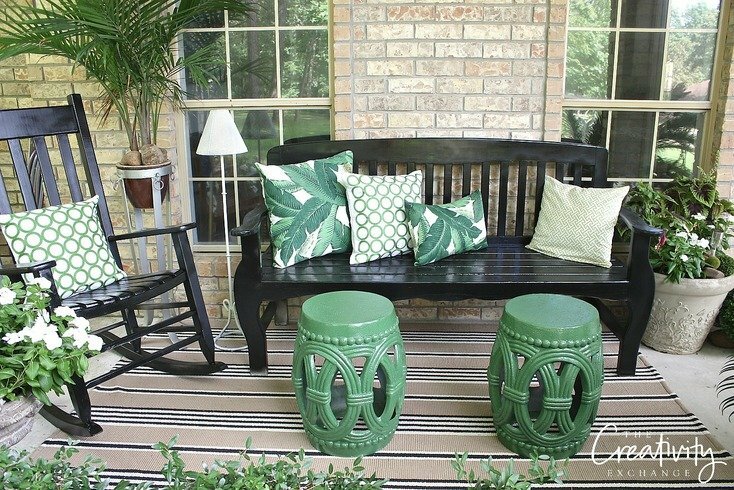 I shared our back patio refresh project a couple weeks ago and if you missed it, you can find that post here. This year, the front porch needed more than just the usual fluffing. It was that dreaded time to power wash the house, paint, fix stuff and repaint all of our outdoor furniture. You know all that stuff that always seems to be needed all at one time and you have to do every few years. I loved the navy and green but after three years, I decided to go shades of green and tan and painted all of the furniture black. 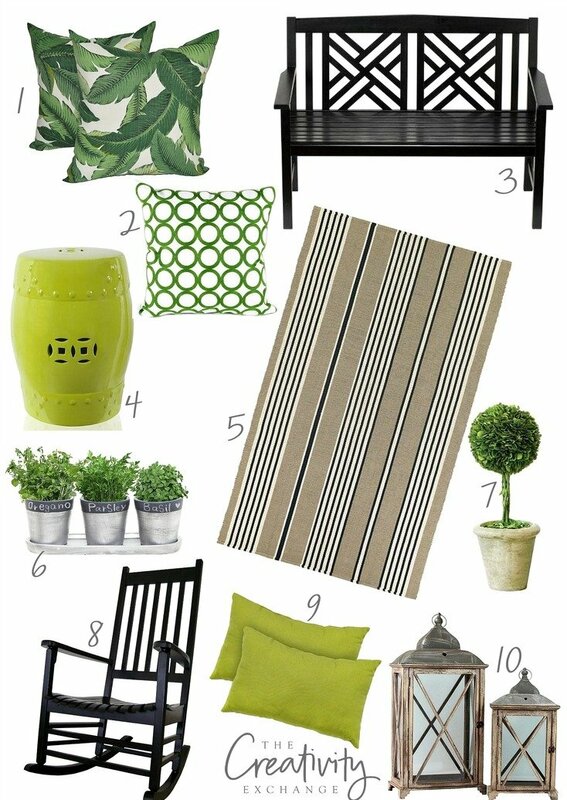 This time, I really wanted our porch to be more of an extension of our yard with all those pretty shades of green. 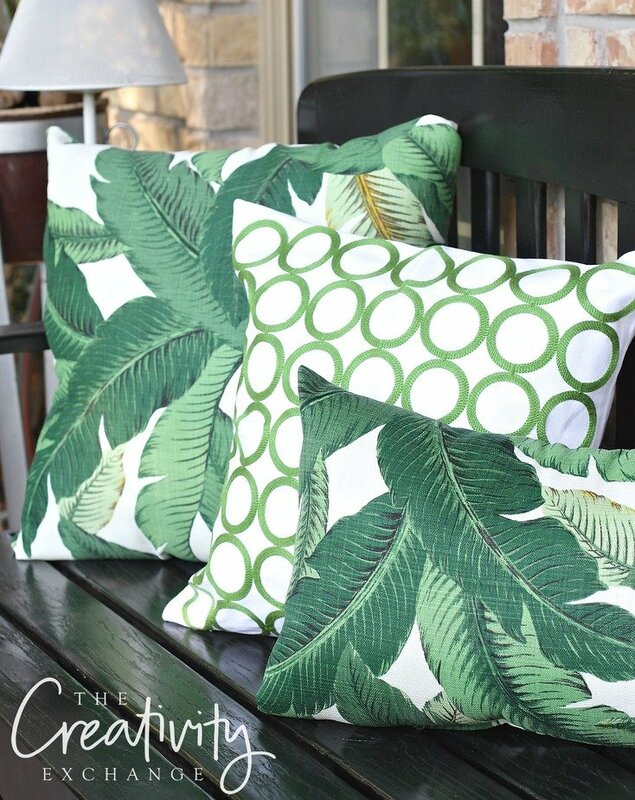 I ran across the palm pillows a few months ago on Amazon and ordered them. 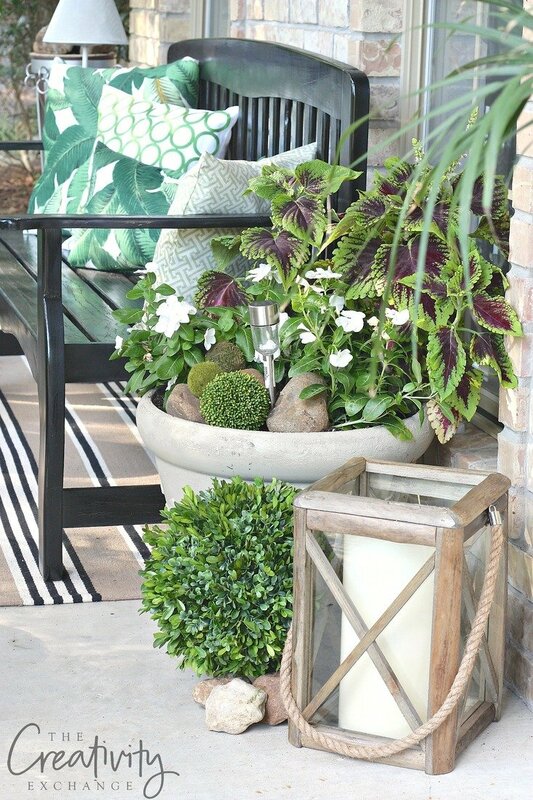 I thought they were just perfect for what I was going for and I used them as the inspiration for my plan for the rest of the colors on the porch. I found more pillows at Hobby Lobby and also this perfect rug from Amazon. I am obsessed with the rug! I was so surprised when it arrived how gorgeous and comfy it is. 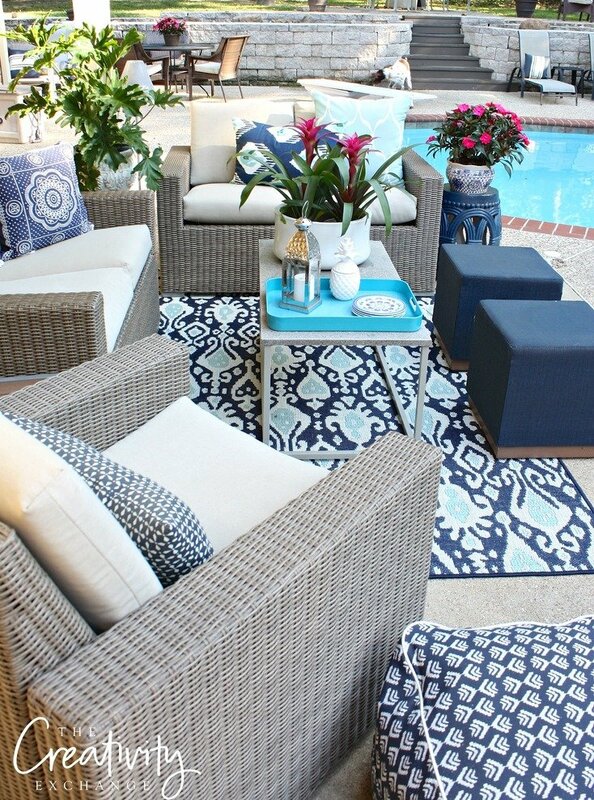 It’s an indoor/outdoor rug, so I’m thinking about ordering one for inside my home (all sources are end of post). 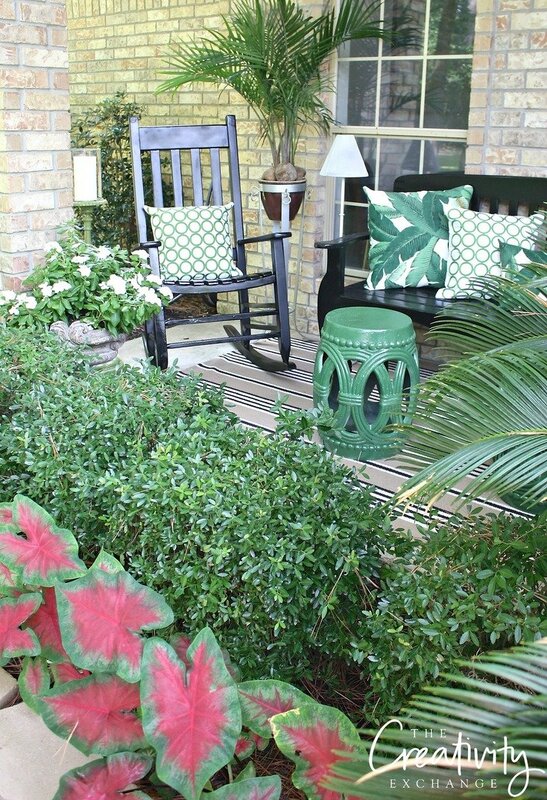 We did all of the furniture painting this weekend and next week, I’ll be sharing the details for those projects but I did want to mention the paint details on the garden stools. 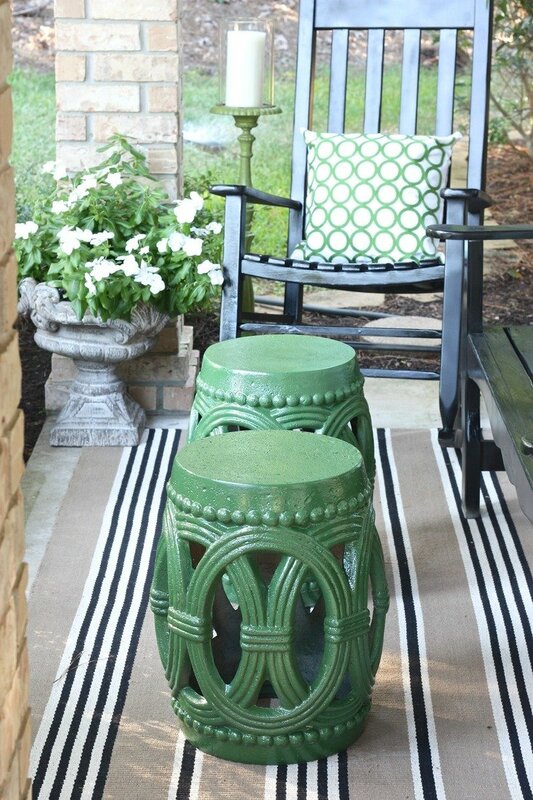 I went through six different colors of spray paint to find the exact color green I had in my head for my pair of garden stools that I have had for years. The color that finally worked was Krylon Seaweed. I also mixed in moss balls, rocks and solar lights into my container pots. 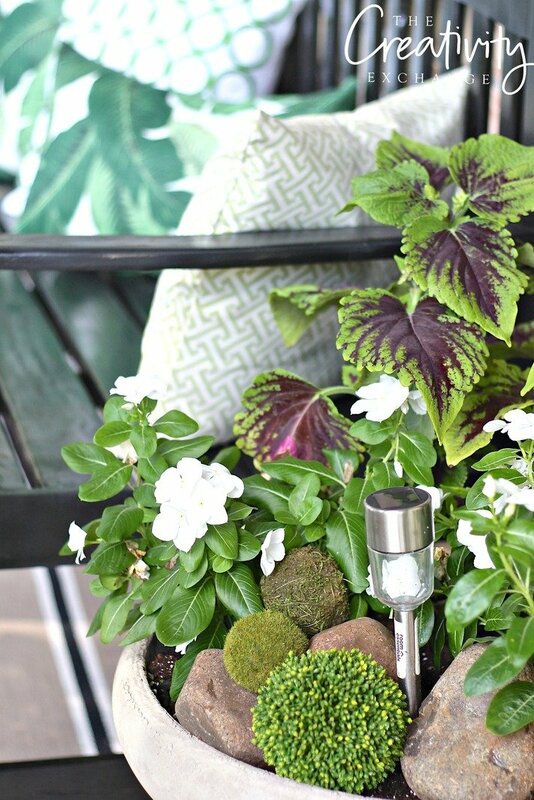 The moss balls and rocks and pretty texture and the solar lights are a great way to add light for night. For those of you interested in all of the sources for the pieces I used on our porch refresh, I have them for you below. Several of the pieces I couldn’t find and I have had for years, so I included some fun stuff that would work as well. 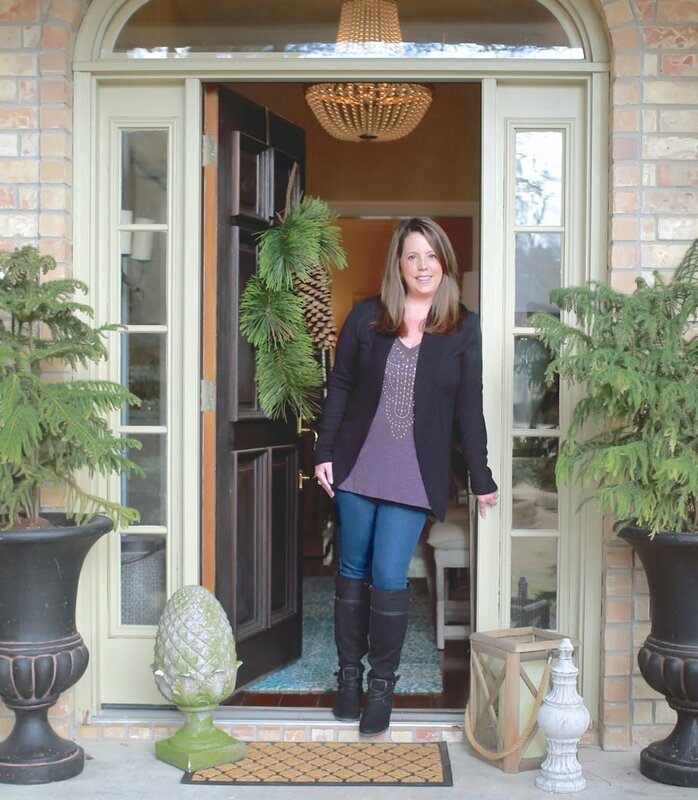 Hi Cyndy — the porch looks fantastic! 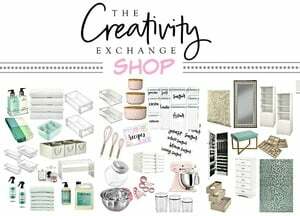 Question — what software/program do you use to create your design boards? They always look so professional! Beautiful! It looks so inviting. I am addicted to your blog! Now I wanna go hang out on your porch. On another note, here’s a technical question, how do you create those great collages? Beautiful work, Cyndy!! 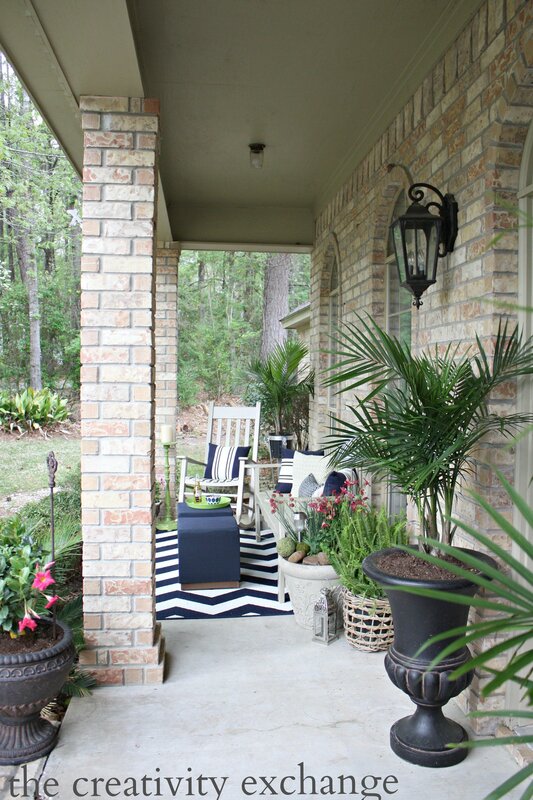 Your front porch is so pretty and inviting! 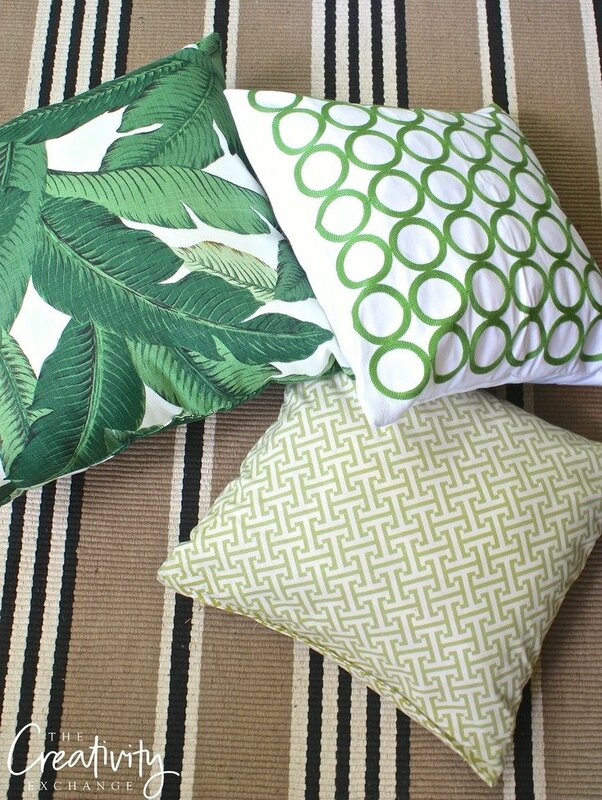 I am a sucker for those palm pillow covers too. I recently added one to my living room and it makes me happy have time I see it. Have a great weekend! Love the refresh! 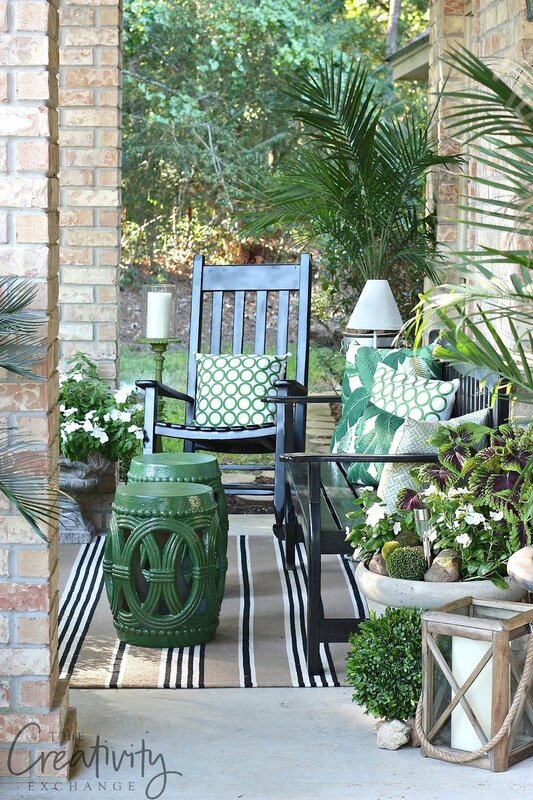 It blends seamlessly with the outdoors, and the PILLOWS! Scrumptious! Kyrlon Seaweed is my new favorite color. Thanks for sharing your talents!